Bishop David A. Zubik of Pittsburgh hears a young woman’s confession during a pro-life youth rally and Mass at the Verizon Center in Washington Jan. 22. Thousands of young people gathered at the arena to rally and pray before taking part in the annual March for Life, which this year marked the 41st anniversary of the Supreme Court’s Roe v. Wade decision that legalized abortion across the nation. (CNS photo/Leslie Kossoff) (Jan. 22, 2014) See LIFE-YOUTH to come. “Can a priest forgive sins?” That is a deceptably complicated question that has several answers. Yes, in the sense that Christ has given authority to His Church to bind or to loose sins. “Then Jesus breathed on them (the apostles) and said, ‘Receive the Holy Spirit. If you forgive anyone’s sins, they are forgiven. If you don not forgive them, they are not forgiven.’” Jn 20:22. It is with this authority that the priest absolves after the General Confession or in the Reconciliation of the Penitent. No, if the penitent is not truly repentant. The absolution begins, “Almighty God who of His great mercy hath promised forgiveness of sins to all those who with hearty repentance and true faith turn unto Him….” The implication is that without hearty repentance and true faith, sins are not forgiven just because the priest says the right words. If you are unrepentant about the sin in your life. It is why we have the General Confession before Communion and in it we express our sorrow to God. If you are at war with your brother or sister and harbor unforgiveness. If you arrive after the Gospel is read. Holy Communion is made up of Word and Sacrament and both are required. Not receiving the Word invites a superstitious approach to the Sacrament. If you are under Church discipline and the priest has barred you from receiving the Sacrament. If these or similar conditions occur you may still make a spiritual communion, which is full participation in the service except for actually receiving the bread and wine. It is also appropriate to come forward, cross your arms over your chest and receive a blessing. 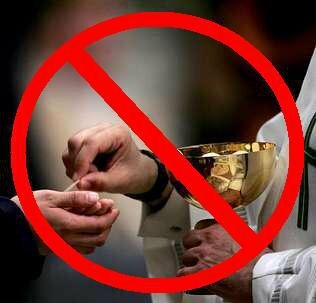 If any of these conditions that prevent you from receiving the Sacrament last for any length of time, it is advised that you make an appointment with the parish priest and get them resolved. 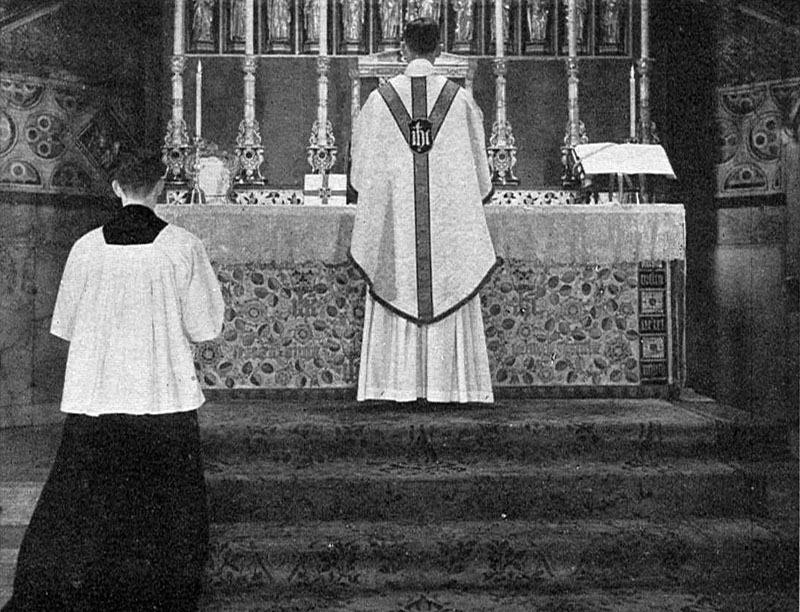 The altar against the eastern wall (ad orientem) is a centuries old tradition full of significance. First it has the people facing east, the rising sun, which is a symbol of the resurrection of Christ. Second, east is also the symbolic direction of His Second Coming (Matthew 24:27). Third it connects the Church militant with the Church triumphant. We are to imagine the altar as the end of the heavenly banquet table, breaking into our time/space world. It is like the kiddie table at a Thanksgiving meal, where we are feasting together with all the faithful departed. Third, the eastward facing altar has the priest face the Lord rather than the people. That is important because his primary duty in worship is to minister to the Lord. 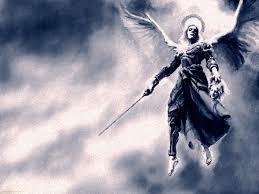 The priest is not the host, he is the officiant, and so he leads by pointing the people to the Host. I once had a Spanish speaking Bishop visit our church and through a translator asked me, “Do you celebrate with your back to the people?” I asked the translator to literally interpret my response. I said, “No sir I do not celebrate with my back to the people. I celebrate facing Christ with the people.” To this he gave a nod of understanding if not agreement. Godly tradition represents the mind of the Church throughout the ages on how Scripture is to be interpreted and applied as well as a guide for where the Scripture is silent. The truth of the Holy Trinity is the finest example of godly tradition. If I had never been exposed to the traditions of the Church and was placed on an island with only a Bible, I would have never understood the doctrine of the Trinity as explained by the Creeds. But once I received the Church’s teaching on it, this truth becomes obvious throughout Holy Scripture. 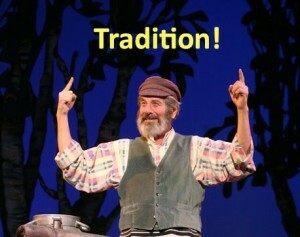 Tradition also guides our common life as a Church. St. Paul told the Church in Corinth that “all things are to be done decently and in order.” How do we do that? The Canons of the Church show us what is decent and in order. Thus I don’t stand up each week and ask, “So who would like to celebrate Holy Communion this Sunday?” Through tradition we understand that is the role of the Bishops and Priests to see that the Sacraments are duly administered even though there is no specific chapter and verse that dictates this. In essence godly tradition is how we preserve the guidance of the Holy Spirit for future generations. Those who care about what the Spirit is saying to the Church today should also care about what the Spirit said to the Church yesterday. Godly tradition is good stewardship in that it saves future generations from wasting time and energy trying to discern what God has already made clear to the Church. If ever a tradition can be shown to be contrary to Holy Scripture then it is by definition not a godly tradition and must be rejected as the traditions of man. We read in the Book of Acts that the Church devoted themselves to the apostles teaching, fellowship, the breaking of bread and the prayers (Acts 2:42). The Mass is divided into two major segments. The first is the Liturgy of the Word. This is how we devote ourselves to the apostles’ teaching. In it we read Scripture, we chant the Psalms and we hear an exposition of God’s Word. 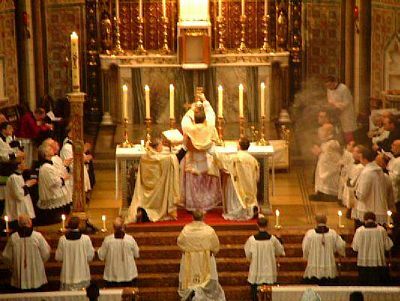 The second major segment is the Liturgy of the Altar. This is how we devote ourselves to the breaking of bread. In it we recall God’s grace to us throughout the ages and above all in the redemption of the world through our Lord Jesus Christ. In it we participate in the New Covenant and unite ourselves with Christ by receiving His Body and Blood. Fellowship and the prayers are woven throughout both major segments. A key element is the participation of all. The word “liturgy” was derived from a Greek word that meant public service. In liturgy the congregation does not sit by passively watching a performance but participates in the prayers and rites of the Church. The priest is only the officiant. He is not the performer. That is why the priest faces the same direction as the congregation as he leads worship. Together we minister to Christ.